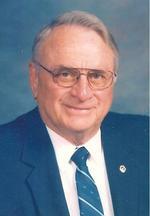 William L. Wolfe, age 79 of Ashland, Ohio passed away Thursday, December 22, 2011 at Arthur G. James Cancer Center in Columbus. On July 4, 1932 in Athens, Ohio Mr. Wolfe was born to the late Leonard and Louise (Jones) Wolfe. He had been a resident of Ashland Co. since 1958. Mr. Wolfe served as an industrial engineer for 30 years, head of security at Ashland University, and worked as a real estate agent. He was a member of Trinity Lutheran Church where he sang in the Men’s Chorus and choir. Mr. Wolfe served with the U.S. Army during the Korean Conflict and a life member of the American Legion, and Elks Lodge, a member of the R.O.A. and M.O.A.A., Ashland Evening Lions Club 39 years. Past President, District Convention Co-Chair in 2001, the Fun Center Chordsmen Barber Shop Chorus, Ashland Community Choir, and a Volunteer Fireman for 47 years. On October 24, 1954 Mr. Wolfe married Shirley Mae Sidle who survives. Also surviving are 3 daughters: Kathy (Jeff) Banks of Ashland, OH., Karen (Robert) Parker III of Evansville, IN. ; and Kelly (Brian) Benton of Orlando, FL. ; 8 grandchildren: Alison & Nate Griffin, Matthew Banks, Bandon & Fiancée Elizabeth Dye, Robert Taylor & Jennifer Parker IV, Kristen Parker, Mitchell Parker, Tyler Dilgard & Madison Mae Dilgard; 6 great-grandchildren.